Cyril was born in Kapunda on the 17th March, 1892 to parents Walter George and Eliza Jane (nee Dunstan). He was one of 5 children. He attended Unley State School and was a warehouseman before he enlisted. He was 5’ 6 ½”tall and weighed 144 lbs on enlistment. He had a fair complexion with blue eyes and dark hair. He was a member of the Methodist Church. He took the oath on the 31st March 1916, although he had previously been examined for fitness in August 1915 and earlier in March 1916. However it was not until September 1916 that he was assigned to the 9th Reinforcement of the 32nd Battalion. He left Adelaide on the 21st September, 1916 aboard the “Commonwealth” arriving in Plymouth on the 14th November. After training in England he proceeded to France from Folkestone aboard the “Princess Clementine” on the 21st December and marched in to camp at Etaples the following day. He had been an Acting Sergeant during training but now reverted to private. He left Etaples to join the 32nd Battalion on New Year’s Eve 1916 and was taken on strength on the 2nd January 1917. The following day he fell ill with acute rheumatism, and was hospitalised for a week before rejoining his battalion. He again fell ill at the end of January. France at this time was experiencing its coldest winter in over 40 years and many men fell ill due to the effects of the extreme conditions that they faced. He remained in hospital in Rouen for all of February and did not return to the battalion until the 12th March. On the 10th May he was attached to the 8th Light Trench Mortar Battery. 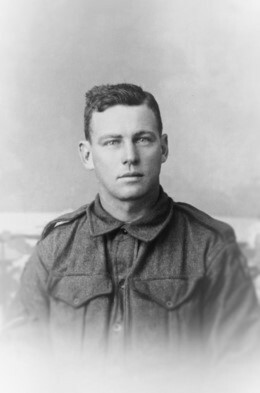 On the 18th June he was promoted to Lance Corporal and in July spent 2 weeks training at the 1st ANZAC Corps School. He remained with the 8th Light Trench Mortar Battery until the 21st October, 1917 when he was wounded with gunshot wounds to the legs including a fracture to his right leg. He died of his wounds later that day at the 3rd Canadian Casualty Clearing Station and was buried in the Lijssenthoek Military Cemetery in Section XXV, Row G, Grave 15A. Cyril was my grandfather’s second cousin. My Great Great Grandmother, Mary Ann Andrew, was Cyril’s great aunty.